The new EXTRA 700 series of front mounted mower conditioners brings new comfortable features to front mounted mower conditioners. It is the ideal combination of effective suspension concept for accurate cutting performance and new operator friendly features. EXTRA 700F is designed around the ProLink suspension, an extremely responsive and durable concept. With its floating 3-dimensional suspension, it delivers excellent ground tracking for accurate cutting performance and great cutterbar protection. 3.20 and 3.50m working width. ProLink suspension concept with three-dimensional ground tracking. SemiSwing steel tine conditioning or chevron roller conditioner. Maintenance-friendly design with focus on operator comfort. Dual adjustment of conditioner plate for accurate setting of conditioning effect. Stubble height adjustment integrated into suspension for easy setting of cutting angle. New self-adjusting swath doors for easy and accurate setting of swath width. ProLink 3-dimensional suspension concept for excellent ground tracking. Very responsive and durable suspension concept with two largely designed suspension spring for excellent stability and even ground pressure. Flexible adaptation range of 250mm downwards and 420mm upwards. Transverse adaptation range of 24º. Generous headland clearance of 420mm. The Vicon ProLink suspension concept provides maximum protection of the cutterbar during operation. If hitting a stone or foreign obstacle, a three-fold action takes place simultaneously. Stubble height adjustment is conveniently integrated directly into the suspension linkage for quick and accurate setting of cutting height. • EXTRA 700F features a host of new improvements to bring operator comfort to a higher level. • Easy access to cutterbar for routine maintenance and service inspections. Complete front hood opens to a 90º positon. • When the front hood is lifted up, it stays in position by a hydraulic damper. • The complete mower is designed for easy servicing and the low maintenance PTO shaft only requires one seasonal greasing. • One touch parking handle, to lock and prepare the mower for dismounting. • The new parking foot is easily activated and keeps the mower in a level position when parked – ready for quick remounting. EXTRA 732FT and 736FT offer dual adjustment of the conditioner plate. The conditioner plate can be adjusted at both front and rear ends to provide full adaptability of the conditioner to crop intensity. The plate can be set at 5 different positions at the front and 5 different positions at the rear. 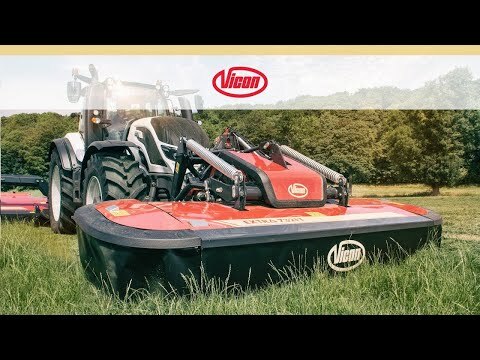 When mowing high and intensive first cut crop you can chose to open up completely at the front and rear end, to allow the massive amount of material to pass through without blockages. built-in, guided swath plates are standard. Changing from spreading to swathing or adjusting the swath width to crop conditions is done in seconds. The swath plates automatically expand when being slid inwards, to support efficient and accurate swathing and there is no need to dismount them to achieve full width spreading. Compact design for good overview during transport and operation. Even when lifted for transport, the EXTRA 700F series provides excellent visibility to the front. Hydraulic folding of FlexProtect guards are available (optional).